Hello, Secordians! Welcome to the first in a series of blog posts that we'll be sharing on the first of every month telling the stories of Secord Firsts. Today, for our inaugural post we are lucky to have Secord Parent Athiya Parveen share her experience with volunteering for the first time. We're sure you'll enjoy! We're looking forward to hearing about your children's first field trip, first homework, first time reading a book on their own and more, all from your point of view. If you're interested in sharing your Secord First with the community email us at secord (dot) council (at) gmail (dot) com. Please address your email to the attention of Tracey Nolan. I am assuming that either you are reading this blog between your coffee break at the office or switching tabs while working from home or enjoying some "me" time while your angel faced preschooler is taking his/her mid morning nap or probably stranded on one or the other mode of transport so will try to capture this enriching experience in a nutshell. The autumn of 2011 was the year the beat of Secord was changing as volunteer involvement was beginning to gain momentum due to the fact that nutrition program had begin to take its due place and also that Secord had a newly appointed enthusiastic Vice Principal interested to know her community through the parents and volunteers. 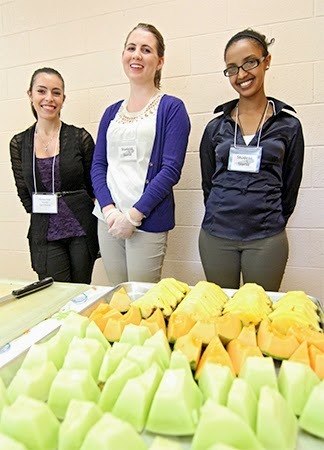 From left, Ryerson nursing students Christina Pulla, Stephanie Siddall and Yemi Demeke get ready t dish out a hot lunch and fruit-slice dessert at Secord Elementary School. I enrolled myself to volunteer in the ESL program with the concerned teaching staff and also to perform clerical tasks in the administration. Altogether, I was assigned 5 students from grade 3 and grade 2. The mornings were spent reading books one on one until pick up time of the Kindergartens since my daughter who had just entered the mysterious labyrinth of the education system had to be picked up. Yeah, I know those were the less tormenting glorious days (or maybe not) for 5 year olds when they were home. Having been brought up in a teaching atmosphere, I had an exposure to the working of the little minds and so jumped in at the opportunity of giving to the community of students. I miss those mornings when each began with the ubiquitous national anthem where with each anthem, I felt more CANADIAN than ever. Another motivating factor to continue volunteering was to be at the receiving end of the extinct characteristics of warmth, passion and unconditional welcome of a few of the teaching staff at Secord surpassing all boundaries of any sort. The lively chitchat with the teachers one has while taking the students back and forth from their classrooms to the ESL room and the indigenous group of parents one meets, connects and cherishes some of them for life are all experiences that can never be replaced and acquired elsewhere. As it was a one on one program, the ESL students would feel comfortable to share their thoughts and feelings about various issues not limited to school scenario alone but also other matters revolving in their vulnerable world. It was a bond not too strong and yet neither fragile that it could be shrugged off and forgotten. One gets enlightened from situations such as these and starts to look at things from the other side of the table. I continue to go on class trips and am a member of a couple of committees and hopefully if time permits, would surely contribute again on a regular basis and humbly appreciate the efforts and perseverance of all those involved in making Secord a place where all Voices are Heard!!! On October 22nd, there was a meeting at Secord Elementary attended by the School Council, concerned parents, our Trustee Sheila Cary-Meaghar, Superintendent Vicki Branco, and TDSB Facilities representatives, engineers, and an outside contractor. They reported on the repairs made so far to the Port-a-pac and the mould tests that were conducted earlier in the year. All findings show that the Port-a-pac meets TDSB Health and Safety standards, and is thus safe. We do however, have continued concerns as these tests were conducted before the water damaged discovered on Friday Oct. 17 and there are still active leaks are occurring. The solution from the TDSB to our Port-a-pack problems seems to be a complete roof repair, to begin this week. This is an expensive option to repair portables that we would much rather see replaced with a permanent structure. Regardless of repairs and tests, we do not feel the ports-pac is a safe or acceptable long-term facility for school staff and our students. We want to know that our appeal for a replacement structure has been heard. We are tired of waiting for the TDSB to prioritize our school's needs. Actions must be taken, decisions need to be made. We want the failing porta-pac at Secord Elementary School replaced with a bricks-and-mortar building that will not only accommodate the already over-capacity student population, but allow room for growth as the community's wishes for Secord to transition to a K-8 school are honoured. We plan to attend and to speak to this goal at the Wednesday November 5th meeting of the facilities and Operations committee at the TDSB building at 5050 Yonge Street. Please join us at this meeting so we can show the TDSB how important this is to our community. The 2014-2015 school year opened with the discovery of water damage to our aging port-a-pac yet again. Over the years this port-a-pac has required many expensive repairs to the roof and structure. Now there are health and safety concerns: mould. Mould was found in the porta-pacs on the first day of school. The leaks were patched, and visible areas were treated, however more evidence of leaks has been found in the weeks since. Another heavy rainfall in Toronto on October 16th resulted in yet more water damage, and the mould that can result could quickly become a major health issue to staff and students. Permanent change needs to happen, and yet we wait for action. In 2012, in the hopes of replacing our aging port-a-pac with a permanent structure, we consulted and worked with our community to complete the DA Morrison Pupil Accommodation Review: Secord would become a K-8 school, Parkside would close, their students joining DA Morrison which would become a K-8 school with French Immersion. However, since that time, nothing has happened. No more plans have been made, nothing has moved forward at the TDSB, and no one will prioritize Secord's place in future funding plans. Our school communities have been stuck in limbo, our port-a-pac continues to deteriorate, and there is no current path forward. The reality is, we need to stop spending our limited funds on temporary band-aid repairs to our port-a-pac, and invest in a much needed and overdue permanent facility. The health of our staff and students requires action, we need a proper addition. We want the failing porta-pac at Secord Elementary School replaced with a bricks-and-mortar building that will not only accommodate the current, already over capacity, student population, but allow room for growth as the community's wishes for Secord to transition to a K-8 school are honoured. Secord Families - we need your help! As a fellow member of the Secord community, we are asking for your help in reminding the Toronto District School Board (TDSB) that the time has come to complete the Pupil Accommodation Review process that we began last year. You can copy and paste the text below into an e-mail to our Trustee Sheila Cary-Meagher and the chair of the board Chris Bolton. Please also copy the message to our Provincial MPP Michael Prue to help us show the province of Ontario how much this means to our community. Please help us remind the board that Secord is as much of a priority as any of the schools being considered in this round of funding approvals. Please send your message in time for the next TDSB Planning and Priorities meeting on June 12th. If you are available, please join us at the June 12 meeting, and once again let our numbers show how important a new facility is to our community. Contact the council (secord.council(at)gmail.com) to discuss transportation. I am a parent/guardian of a child at Secord Public School. We need you to right a wrong. We need you to approve the DA Morrison Pupil Accommodation Review, so that we can move forward as an equal priority to George Webster, when the Provincial Team makes their funding decisions. Last year we went spent months consulting with our communities to complete the DA Morrison Pupil Accommodation Review. We worked together and came up with a solution: Secord would become a K-8 school, Parkside would close, their students joining DA Morrison as it becomes a K-8 school with French Immersion. Some of these changes require renovations, and /or building updates. In Secord’s case we need our current 20+ year old port-a-pack, to be replaced with a permanent structure that can also accommodate full day kindergarten and the new 6-8 classes. Other schools in our Ward are also feeling the pressure on their existing accommodations, and we understand and support their needs. However, our port-a-pack has long since reached the end of it’s useful life, and it is continuously requiring expensive maintenance and repairs in order for it to meet the minimum acceptable level of student accommodation. We will also need to increase our capacity in order to accommodate full day kindergarten, which is coming to Secord in Sept. 2014, we need our building to grow to support the increased population. Secord is as much of a priority due to accommodation pressure, maintenance requirements, and safety as any of the schools being considered in this round of funding approvals. Since November, Secord has been stuck in a cycle where the TDSB blamed the province for not releasing funds for capital expenses, and the province has blamed the TDSB for not prioritizing it’s needs. The reality is, we have been delayed 7 months due to an oversight and we can go no further until the PARC is approved by you. We need to stop spending our limited funds on temporary band-aid solutions, like repairs to our port-a-pack, and invest in a much needed and overdue permanent facility. It’s time for you to correct the oversight of not having our PARC approved last November. Identify Secord as a priority and approve the DA Morrison Pupil Accommodation Review immediately and submit it for approval to the Provincial team along with George Webster in this round of approvals. 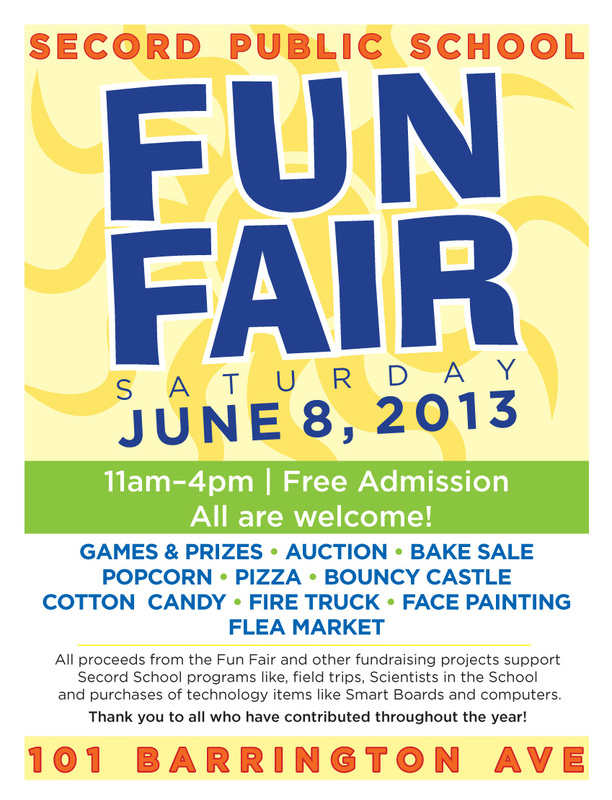 Secord Fun Fair - June 8th! Bouncy Castle! Games! Auction! Food, Flea market, Face painting and FUN! Come to Secord on Saturday June 8th and enjoy the fair and help us raise funds for school programs and technology resources! Parents and students from Secord Elementary School, along with representatives from four neighbouring schools, descended upon a TDSB Planning & Priorities committee meeting on Wednesday 30 January to impart the urgency of putting their school's capital spending needs at the top of the TDSB's priority list. The message was simple: It's our turn. The expectation is the TDSB will address the existing and persistent facilities challenges at Secord Elementary. They will also have to consider the space challenges full-day kindergarten will present in 2014, not to mention the community's interest in transitioning from a K-5 to a K-8 school, in an already over capacity building operating out of rotting twenty year-old port-a-paks. The Secord Parent Council hopes to take the same message to the Ontario provincial government in the coming weeks with the expectation of provincial funds being released. We are very pleased to be able to provide our Secord Parents with learning opportunities to better support our students. We have organized the following dates and topics according to parent request. Child minding will be provided. All workshops, unless otherwise indicated, will run from 6-7:30pm in the library. A few articles featuring Secord School Council Co-Chair, Peter Saros and parent Heather Tormey where they discuss the state of Secord's port-a-pac and concerns over equity of funding for facilities. Welcome to the Parent Council blog for Secord Elementary School in Toronto, Ontario, Canada.